Pick you up from your hotel in Beijing by our private tour guide & driver at 5:00 AM. Be transferred to airport and fly to Shanghai. Shanghai airport pickup. Have a bird’s view of whole Shanghai at Oriental Pearl TV Tower. Take a pleasant stroll in the classical southern Chinese Yuyuan Garden. 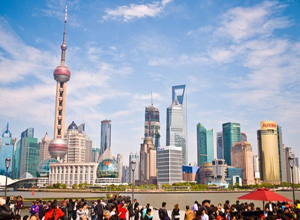 The two most important Shanghai attractions-the Bund gives amazing views, and the Nanjing Road is the renowned shopping heaven. After the tour, be transferred to airport and fly back to Beijing. Beijing airport pickup and hotel transfer. *China internal flights: Beijing-Shanghai (CA1831, Dep. 07:30 – Arr. 09:40); Shanghai-Beijing (HU7602; Dep. 20:40 – Arr. 23:00). What is the cost (incl. flight) for 3 adults and 1 child in Sept./Oct. 2014 for a one day tour in Shamghai from Beijing? We just sent an email to you, please check. Thanks! Please advise cost of one day Beijing-Shanghai-Beijing tour for two adults. Thank you for your message. Please let me know your tour date, then we can give you the best price for that day.